Someone asked me why I work around millets so much. What is the goal I am working towards when I promote millets, traditional recipes that are getting lost and age old nutrition wisdom. I was thinking of the age old wisdom that is being taken over by consumerism and 'tactful' nutrition information fine printed on shiny food packets. I asked him what did he have for breakfast and he told me about a crisp toast with French butter and some fruit preserve. 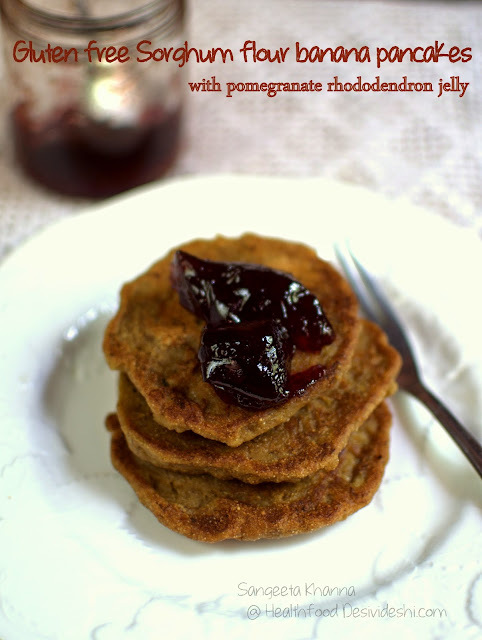 I told that I made a gluten free sorghum flour and banana pancake and had it with pomegranate rhododendron jelly. Jowar kele ka cheela, as we would call it and he wanted to know more about the pancake and how millets can make such tasty foods. The interest was ignited immediately. reassuring in different ways, and my own quest giving me enough reasons to continue what I love doing. I never follow a goal but do what I like at the moment, taking life as it comes, plans never worked and surprises were always good. But yes, I do have a reason for reviving old times wisdom and alternative grains, Indian native foods and cooking techniques and most importantly the love for cooking family meals at home. I don't have to explain those reasons for you my friend, because you have subscribed to my blog and have been reading what I think about these. I would explain my concern about the millets for a reason today. I am an environmentalist by instinct, I feel frustrated to see how the soil health is depleting by monoculture of wheat and rice in different agricultural areas while millets are being neglected. For ages millets were considered food of the poor. How many of us know that millets take very few resources to grow? These are mostly rain fed crops and do not deplete water resources, do not need pesticides and insecticides much and can be grown organically well. And there are health benefits that you know already. I know because you are reading healthfood desivideshi and have clicked to read this piece of information. I know you too hate quinoa and use alternative flours for everyday cooking like I do. Make a batter using the flour, the mashed banana, flax meal, chopped nuts and milk. Add just enough milk to make a thick batter. Heat a griddle and smear ghee over it. Pour small ladlefuls of batter over the griddle and let it cook for a couple of minutes on one side, over medium flame. Turn over and cook the other side too to get a golden crust. Serve hot or warm with any fruit preserve or honey you like. This time we had the pomegranate and rhododendron jelly with it. I like the pancake plain with some hot milk, the husband always likes some jam or honey with his pancakes. The pancake keeps me full till evening if I have it with milk. I normally munch on some salted roasted nuts or peanuts in between because I don't feel good after eating something sweet but that is me. I must tell you that I have seen some people eating such pancakes with laal mirch ka acahar too and that actually tastes really good. A combination of sweet and spicy is actually good. Tell me if you want to learn more about millets. For health reasons and for environment too, I will make sure there is some millets everyday on your table. Or that is being over ambitious? 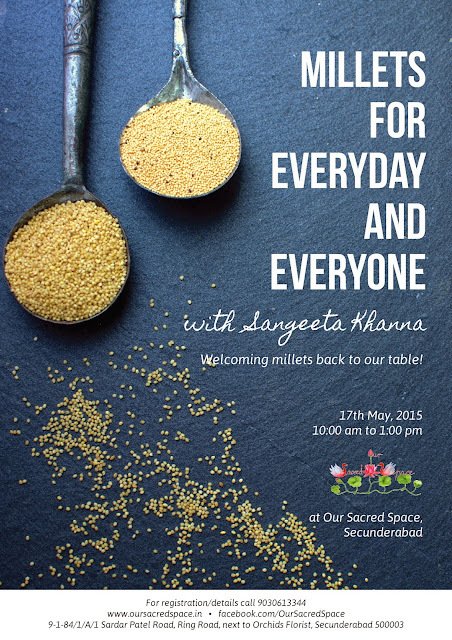 I will be in Hyderabad next week, and will conduct a workshop with a millets theme, millets for everyone and everyday, at Our Sacred Space. If you are in Hyderabad and want to learn how to cook with millets everyday, you are welcome. Please sign up with this workshop and have fun with millets. We are planning to serve this sorghum banana pancake too at the workshop. Would you like to join us there? Loved this recipe, Sangeeta. I will certainly be trying it as soon as I get some jowar atta. Yes, please more millets recipe. I love cooking with them. This morning I made a breakfast of besan ka pithla with makki ki roti. Thanks Rachna. 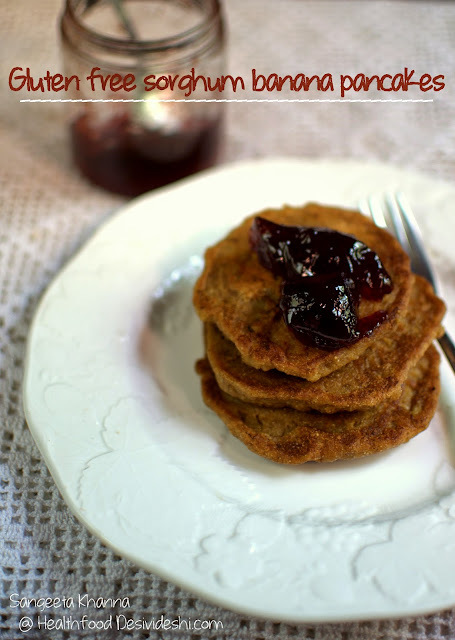 I have been sharing millet recipes and will share more. Please check 101alternative flour lable to find more of them.